The Location Config sub-menu of the Admin module allows your film office to customize the location fields that can be seen by the public, whether they are searching through your location gallery or are examining a package that your office has sent. 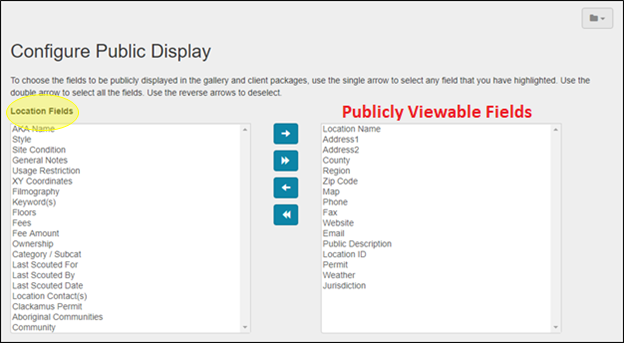 To access the Configure Public Display page, enter the Admin module. In the Admin module, select Location Config from the sub-menu. 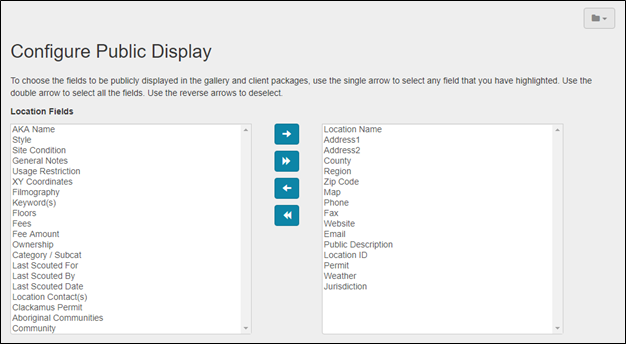 Clicking Location Config will take you to the Configure Public Display page. The Configure Public Display screen is divided into two halves: the left-hand window contains the fields that are available for use. The right-hand window shows the fields that the public can currently view. To add a publically displayed field, click on the type of field that you want the public to be able to view. Then, select the right arrow to move it to the window on the right-hand side. To hide a location information field from public view, select the field that you want to remove from the window on the right-hand side of the screen. Click the left arrow to move that field to the left-hand window. If you wish to make all of the available fields viewable, click the two triangles that point to the right. Clicking the two triangles which point to the left will clear your “currently viewable fields” window, allowing you to start over with a clean slate.